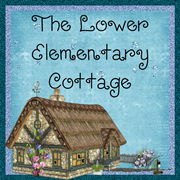 The Lower Elementary Cottage: Busy, busy, busy! Any great books for social skills? Busy, busy, busy! Any great books for social skills? I made it to 50 followers yesterday!! Yay!! Thanks fellow bloggers! I'll have a giveaway when I get to 100!! I'm half way there! Today was a super busy day! I had a student return to my class after trying out a different class for a few days last week. Long story... either way today was a bit of a challenge because he doesn't know any of our routines now! I had planned to jump into some curriculum today, but it was really hard when he never knew what he should be doing or where things went. Last week the rest of my class learned they are not working on the same things and I take turns teaching them. This little guy was lost and didn't understand why he wasn't doing the same things as him. He'll get into the swing of things soon enough. It also didn't help that his learning buddy was out for testing so he had no one to copy the procedures from. Kinder had their first day really learning, and there were a few tiny tantrums including "But I don't know my letters!!!" I tried explaining that's exactly why we're practicing them together, and why I'm they're teacher. It slowly started to sink in by the end of the day. Today was all about asking for help instead of whining "I can't do it!" That's a huge one in my class! I don't help kids that whine, only ones who ask for help nicely. I have a rule in my class: I will never be mad if you make a mistake, I'll always be mad if you don't try. These little guys are still learning it, and a big part is knowing when to ask for help. And I'll tell ya, it's a challenge doing hand-over-hand letters practice with not one, but two lefty kids (I'm right handed)!! I have one little guy who is my little genius. He already knows how to read and has great comprehension, so I'm taking a new approach to reading with him. I've decided he'll "read to learn" instead of "learn to read." The biggest thing he needs is explicit social skills teaching. I have tons of social skills books for grown ups, but I really want to use picture books to have him learn a social skill, while also practicing predictions/setting/characters, etc. Here's where you come in... do you have any great books for a specific social skill?? Examples: sharing, taking turns, not touching others, making friends, etc. My plan is to make worksheets and learning activities to practice the skills in the book. 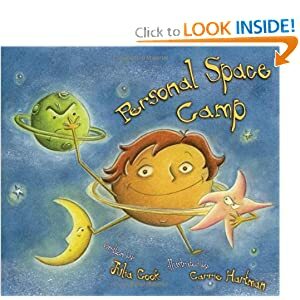 So far I've chosen Personal Space Camp by Julia Cook, and Whole Body Listening Larry at School! by Elizabeth Sautter & Kristen Wilson. These two books are explicitly about social skills, but I'd be happy with fiction books with great socials included in the story. I'll post what I make here and maybe my TPT store. Today Kinder started their color unit. I have great centers for when they know how to read the words, but for now I needed to start with the basics. We did color work pages together for red and blue. 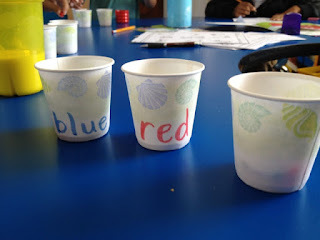 Then I had the kids match the color words when they are written in the correct color marker ("red" with "red" and "blue" with "blue"). I'll post pics of that tomorrow. 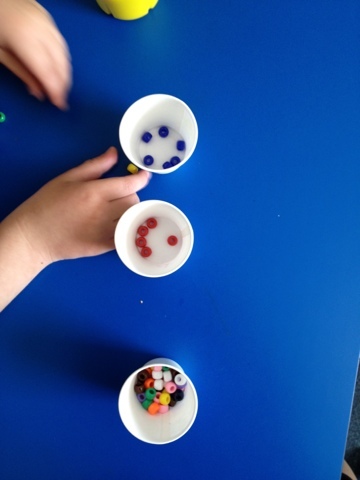 For our hands-on learning activity we separated beads into red, blue, and neither. Tomorrow we'll do the same activity but add in yellow and green. I've seen this one at school somewhere. I think the speech teacher has it. I'll ask if I can borrow it! Rainbow Fish is a book that I always use to teach about sharing but if you want explicit teaching anything by Cheri J. Meiners is awesome! 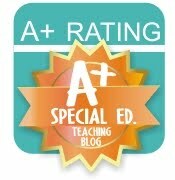 She has many books on specific social skills AND she includes tips for teachers and parents. Totally worth every penny.